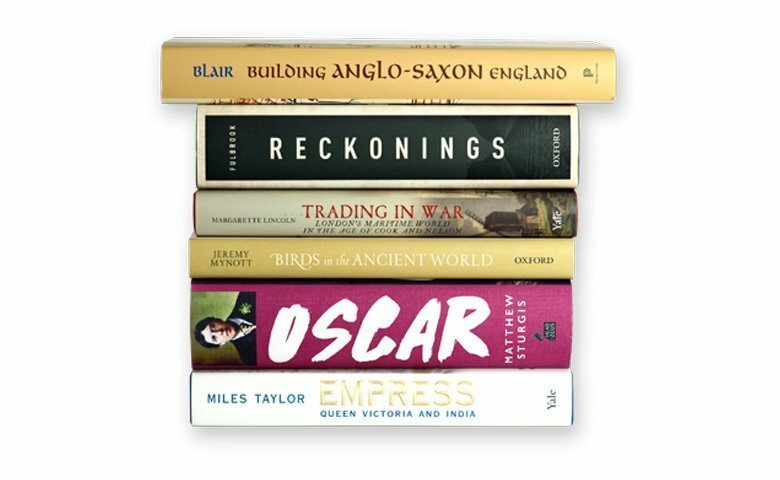 The shortlist for the Wolfson History Prize 2019 is revealed today, celebrating the best new historical non-fiction books in the UK. From a major new biography of Oscar Wilde, to an entirely fresh take on Queen Victoria as Empress of India, and from a history of the human impact of the Holocaust, to an exploration of the role of birds in the Ancient World, the books shortlisted for the most prestigious history prize, and most valuable non-fiction prize in the UK, each combine excellence in historical research with readability. Individual and personal histories feature prominently in this year’s shortlist, which includes works offering fresh insights into influential historical figures Oscar Wilde and Queen Victoria, and books exploring the impact of global conflict on ordinary people. ‘Oscar: A Life’ by Matthew Sturgis – the only work by a non-academic historian to be shortlisted – is the first major biography of Oscar Wilde in thirty years. Offering a wealth of new material to create a rich and moving portrait of Wilde and the era in which he lived, Oscar: A Life demonstrates why Wilde is as relevant today as ever and presents him as an inspiration to all those who seek to challenge convention. ‘Empress: Queen Victoria and India’ by Miles Taylor is an entirely original account of Queen Victoria’s relationship with India, highlighting not only her cultural, political and diplomatic influence on India, but also how passionately involved with the country she was throughout her reign. Two of the shortlisted works examine the impact of war, persecution and conflict on an individual, human level, bringing untold and forgotten histories to the fore. ‘Reckonings: Legacies of Nazi Persecution and the Quest for Justice’ by Mary Fulbrook explores the lives of both the victims and the perpetrators of the Holocaust, illuminating the stories of those who have previously remained outside the media spotlight, while exposing official myths about dealing with the past, and the extent to which the vast majority of Nazi perpetrators evaded justice. ‘Trading in War: London’s Maritime World in the Age of Cook and Nelson’ by Margarette Lincoln is a vivid account of the forgotten citizens of maritime London who sustained Britain during the Revolutionary Wars, harnessing little-known archival and archaeological sources to highlight the pervasive impact of war. Offering fresh perspectives on ancient history and exploring humankind’s relationship with nature, ‘Birds in the Ancient World: Winged Words’ by ornithologist Jeremy Mynott, uses representations of birds in Ancient Greece and Rome as a prism through which to explore the similarities and differences between ancient conceptions of nature and our own. Meanwhile, ‘Building Anglo-Saxon England’ by John Blair is a radical rethinking of the Anglo-Saxon world that presents the latest archaeological discoveries to reappraise the origins of towns, villages and castles, highlighting how the natural landscape was modified for human activity. The winner of the Wolfson History Prize 2019 will be named at a ceremony at Claridge’s Hotel, London, on Tuesday 11 June. The winner will be awarded £40,000, with each shortlisted author receiving £4,000. The Wolfson History Prize is run and awarded by the Wolfson Foundation, an independent charity that awards grants in the fields of science, health, education, arts & humanities. The Wolfson History Prize 2019 Shortlist will be showcased at a live recording of BBC Radio 3 Free Thinking, hosted at the British Academy in London, on Tuesday 7 May. Chaired by Professor Rana Mitter FBA, the 2019 shortlisted authors will debate history writing and offer an insight into each of their books. Tickets can be purchased from The British Academy. Copyright © 2019 The Wolfson Foundation Registered Charity in England and Wales (charity no. 1156077).